our community free of crime, as well as the fear of crime. It has taken many years of dedication and hard work for us to build the organizational culture after which our current police operations are modeled. 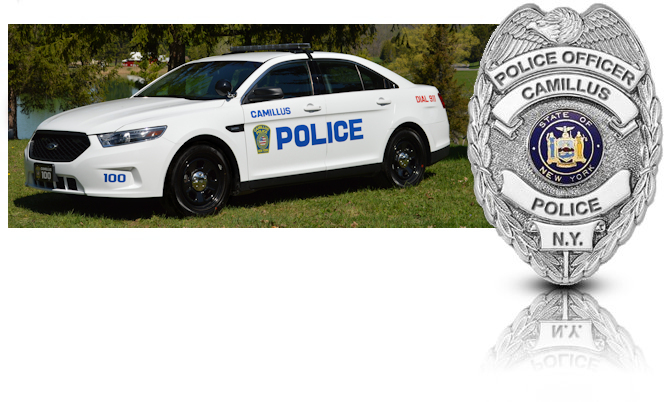 Your local Camillus Police Department provides a full service, community-oriented style of public safety, tailored to the needs of our growing community. We are proactive in our commitment to provide the services that our residents have come to expect and we will continue our efforts in the years to come. It is with great familiarity and effectiveness that we take care of the law enforcement needs of our visitors, businesses and commuters as well as the approximately 25,000 people who live in the Town and Village of Camillus. Our service area stretches over 34 square miles, including 133 linear miles of residential streets, secondary roadways, and highways. In Camillus there are 8705 residential parcels, 28 apartment complexes, 8 schools, 6 parks, 515 commercial and retail properties, and some of the most scenic farmland in all of upstate New York. As the primary law enforcement agency in our community the men and women of the Camillus Police Department serve with unmistakable pride and integrity, which has garnered the organization tremendous community support. Subscribing to a philosophy of community policing, we provide a unique and personalized brand of customer service seldom seen in other police agencies. Through strong police/community partnerships, the Town of Camillus enjoys an extremely low crime rate which contributes to a very desirable quality of life for our residents. I encourage you to revisit our website from time to time for recent changes, information and new services or programs. We look forward to working with you to make Camillus the safest community in upstate New York. I can be reached at: twinn@townofcamillus.com or at (315) 487-0102 if you have a question or concern that you would like to contact me about.